Workout loads and volumes vary based on your goals. Depending on your workout goal, a high-rep exercise routine might not contain as many reps as you think. For muscle-building workouts, high-rep workouts might contain only a few more reps than a low-rep workout, based on the amount of resistance you use. 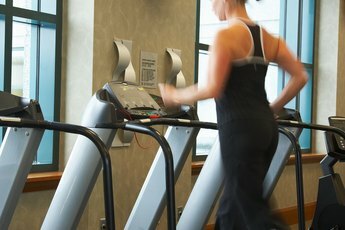 For a cardio workout, the number of reps might increase significantly. To decide whether you want a high-rep or low-rep workout, consider your goals. If your goal is muscle building, you’ll need higher resistance levels, or loads. If your goal is toning, you’ll need low-load, high-rep workouts to burn calories while you build some muscle. While a high-load, low-rep workout is appropriate for bodybuilding, it’s not effective for a cardio or toning workout because your muscles will fatigue too soon for you to create 30-minute fat-burning routines. In bodybuilding, a low-rep workout might consist of three to six repetitions of an exercise using close to the maximum load you can use, while a high-rep workout might be only eight to 12 reps using 60 percent to 70 percent of your maximum weight. Because both workout options require lifting heavy weights, you can’t perform dozens of reps as you can during a cardio workout with less resistance. 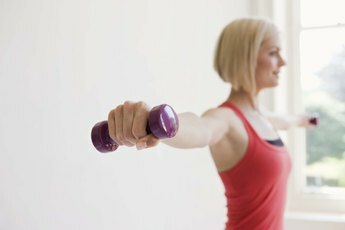 If your goal is adding resistance to an aerobic workout, you might used timed sets of exercises using a light 3- or 5-pound dumbbell or resistance bands wrapped around your wrists only two or three times. For example, instead of performing 10 reps, you’d perform reps for 60 seconds before changing the exercises. If your goal is maximal muscle building, perform your reps slowly, leaving a pause between uplifts and downlifts. This increases the amount of muscular effort you need to use because you don’t allow gravity to drop the weights down or momentum to help you bounce back up. If your goal is to improve muscular endurance or to burn more calories, you’ll perform your reps more quickly by taking advantage of gravity and momentum to prevent muscle fatigue and let you keep working longer. No matter what type of workout you plan on doing, start with a warm-up of low-resistance dynamic movements to get your circulatory and musculoskeletal systems ready for intense exercise. Do jumping jacks, jogging in place and arm swings for two minutes or so to get blood flowing to your muscles and your heart rate elevated. When you’re sufficiently warmed up, perform your exercise sets. Finish your workout with several minutes of low-resistance movements that let you gradually reduce your body temperature and heart rate. Follow your cool-down with a stretch. 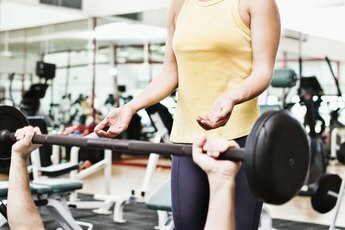 What Does 3x5 Mean in Weight Training?